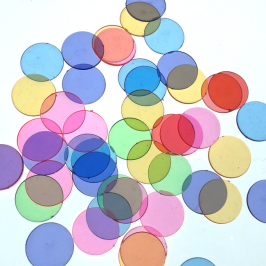 There are a lot of ways to explore with colors; one of my favorite right now is at the light table. 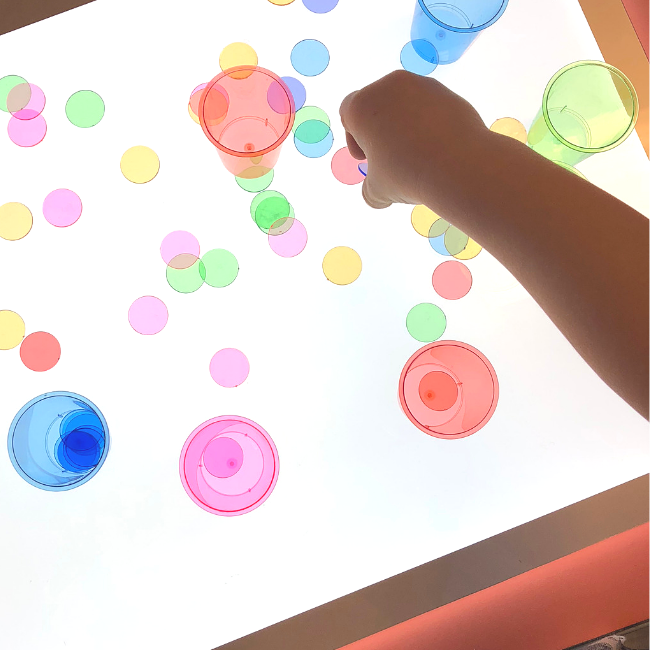 Not only does this focus more on visual sensory experiences but this simple set up invites children to work on fine motor skills and leads very naturally to counting as well! There is no one right way to do this, and I don’t direct my students, however, as I observe if they are counting out loud, I will extend their learning with some well-chosen prompts. 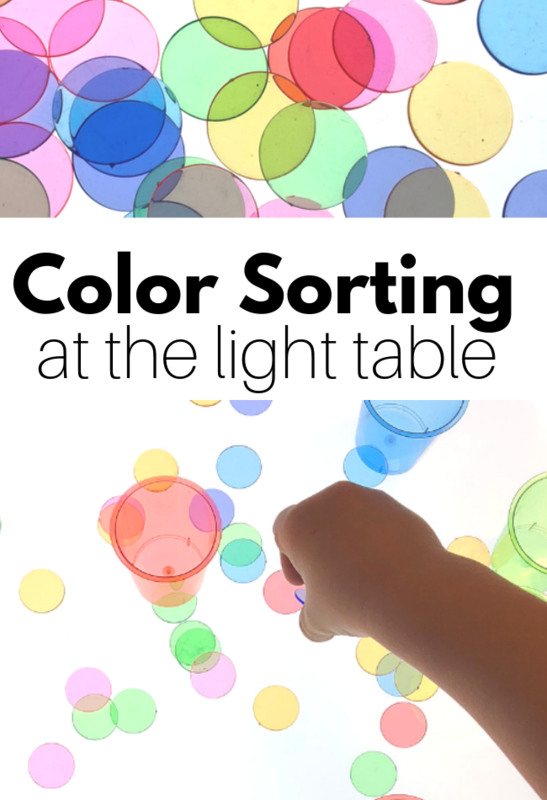 This light table color sorting activity works without a light table or tablet like mine, but trust me preschoolers love the addition of the bright light! The only wrong way to do this is with children who are still placing things in their mouths if that’s the case try this activity I shared on Instagram. Gather your materials. You will need a light table or a light tablet. 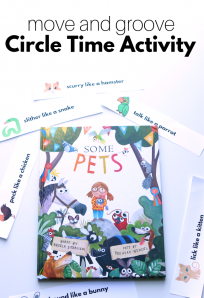 I love my light tablet because I can put it in all different places in my classroom even using it at circle time! Also, it’ a lot less expensive than the tables. You will also need some bingo chips, or clear plastic letters ( I’ll show you pictures of both below), and clear plastic colored shot glasses. Trust me I never thought I’d include the words shot glasses on this blog, but I love these things! That’s it. 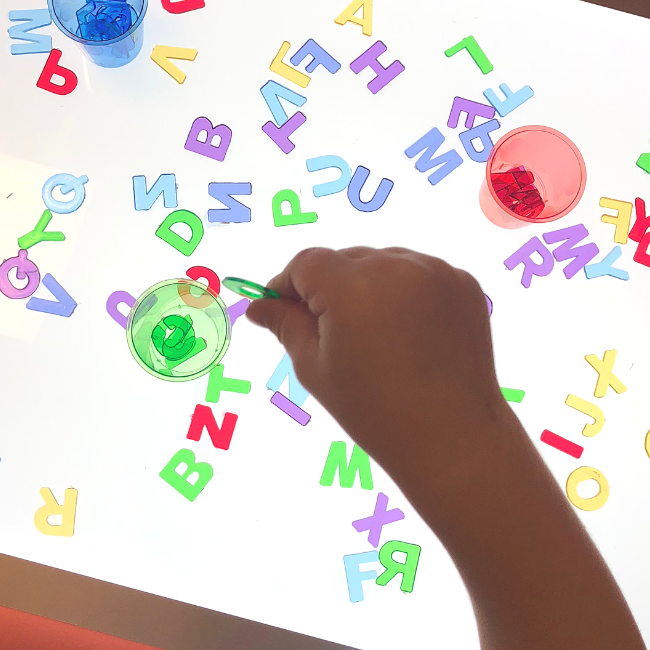 Scatter the bingo chips or acrylic letters on the light tablet/ table. Add the shot glasses in matching colors. Watch those little fingers work hard to pick the chips up! 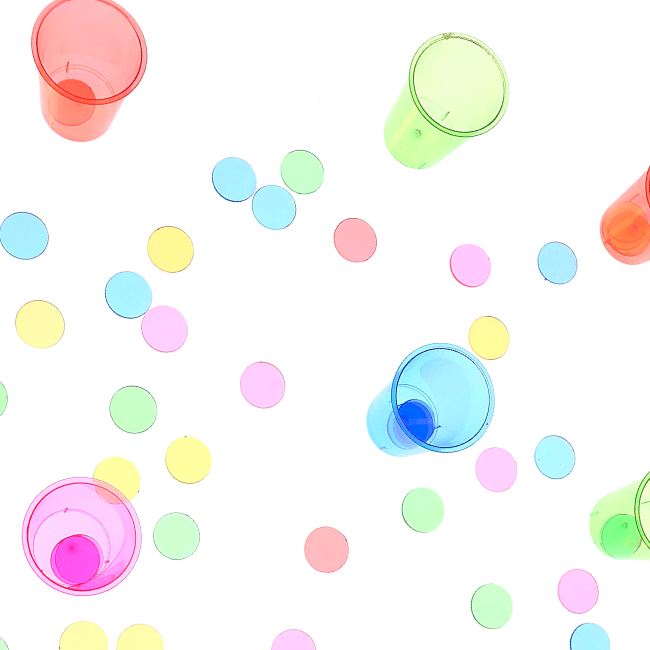 Then use color recognition to choose the right shot glass, and use hand-eye coordination to pop it in. So much learning and development in such a colorful and simple activity. 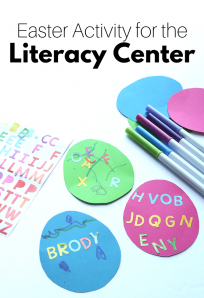 I started with bingo chips in my classroom, then moved to letters. 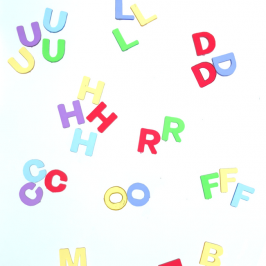 It’s worth noting that many of my students are just at the very start of letter recognition at three years old and we are NOT pushing them; we are simply allowing them to play with letters to get used to them. 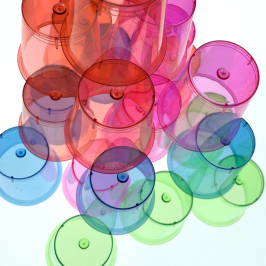 Skip the shot glasses and use bigger bowls like these to make a larger “target” for developing hand-eye coordination. For children mastering this with good letter recognition use sharpies to write letters on the shot glasses to sort. Need even more challenge? 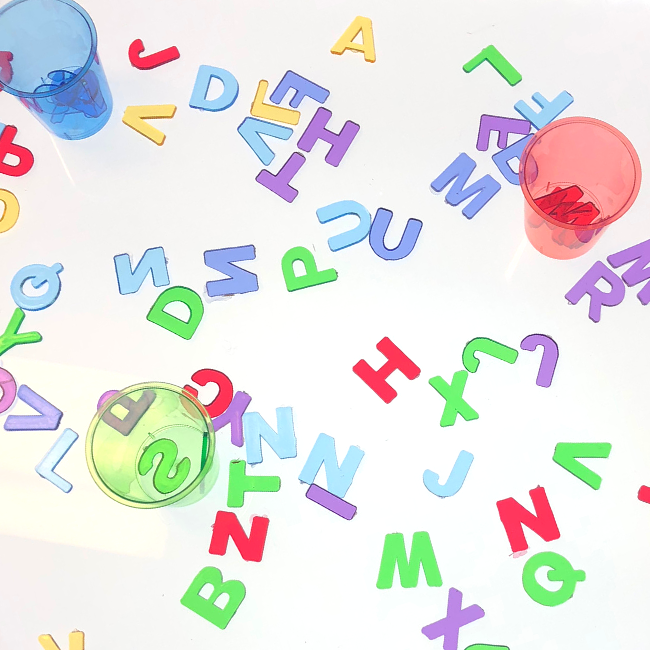 Write the lowercase letter on the shot glass for the students to match up the uppercase letter pieces into. Above all else have fun and observe your students carefully to see what skills they are working on so that you can be there to support and scaffold! 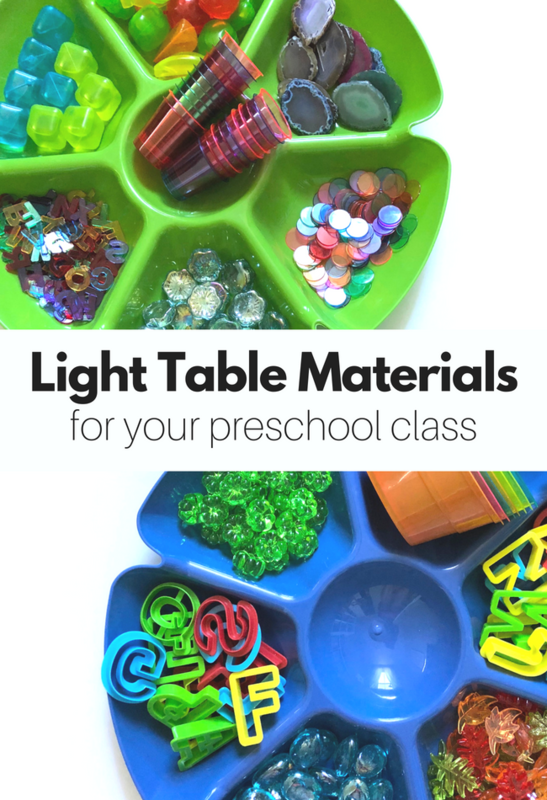 For more great light table ideas check out these materials! A light table would make everything more fun! 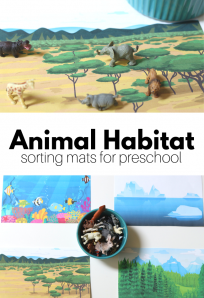 What a great idea and so many things to sort.